I’ve talked about Pivotal Container Service (PKS) before and now work for Pivotal, so I’ve frequently got K8s on my mind. I’ve discussed at length the benefits of PKS and the creation of K8s clusters, but didn’t have much of a point of reference for alternatives. I know about Kelsey Hightower’s book and was looking for something a little less in-the-weeds. I used VMware Fusion on the Macbook to create and run two Ubuntu 18.04 VMs. Each was a linked clone with 2GB RAM, 1vCPU. Had to make sure that they had different MAC addresses, IP, UUIDs and host names. I’m sure you can use nearly any virtualization tool to get your VMs running. Once running, be sure you can SSH into each. I thought, “hey I’ve done this before” and just installed Docker as per usual, but that method does not leverage the correct cgroup driver, so we’ll want to install Docker with the script found here. Once again, the kubernetes.io site provides commands to properly install kubeadm, kubelet and kubectl on our Ubuntu nodes. Use the commands on that page to ensure kubelet is installed and held to the correct version. Ok, what? CNI is the Container Network Interface is a specification for networking add-ons for K8s. Kubeadm requires that we use a pod network addon that uses the CNI spec. The pod network – we may have only one per k8s cluster – is the network that the pods communicate on; think of it as using a NAT rather than the network you’ve actually assigned to the Ubuntu nodes. Further, this can be confusing, because this address space is not what is actually assigned to the pods. This address space is used when we “expose” a service. What pod-network-cidr you assign depends on which network add-on you select. In my case, I went with Canal as it seems to be both powerful and flexible. Also, the pod-network cidr used by Calico is “192.168.0.0/16”, which is already in use in my home lab – it may not have actually been a conflict, but it certainly would be confusing if it were in use twice. Make a note of the bottom section as we’ll need it in order to join our worker to the newly-formed cluster. By default, the cluster will not put pods on the master node. If you want to use a single-node cluster or use compute capacity on the master node for pods, we’ll need to remove the taint. Now, back on master, we run kubectl get nodes and can see both nodes! At this point, we have a functional kubernetes cluster with 1 master and 1 worker. Next in this series, we’ll deploy some applications and compare the behavior to a PKS-managed kubernetes cluster. So, you’ve installed PKS and created a PKS cluster. Excellent! Now what? We want to use helm charts to deploy applications. Many of the charts use PersistentVolumes, so getting PVs set up is our first step. There are a couple of complicating factors to be aware of when it comes to PVs in a multi-AZ/multi-vSphere-Cluster environment. First, you probably have cluster-specific datastores – particularly if you are using Pivotal Ready Architecture and VSAN. These datastores are not suitable for PersistentVolumes consumed by applications deployed to our Kubernetes cluster. To work-around this, we’ll need to provide some shared block storage to each host in each cluster. Probably the simplest way to do this is with an NFS share. In production, you’ll want a production-quality fault-tolerant solution for NFS or iSCSI, like Dell EMC Isilon. For this proof-of-concept, I’m going to use an existing NFS server, create a volume and share it to the hosts in the three vSphere clusters where the PKS workload VMs will run. In this case, the NFS datastore is named “sharednfs” ’cause I’m creative like that. Make sure that your hosts have adequate permissions to the share. Using VMFS on iSCSI is supported, just be aware that you may need to cable-up additional NICs if yours are already consumed by N-VDS and/or VSAN. We’ll need a handful of command-line tools, so make sure your workstation has the PKS CLI and Kubectl CLI from Pivotal and you’ve downloaded and extracted Helm. pks create-cluster pks1cl1 --external-hostname cl1.pks1.lab13.myenv.lab --plan "medium" --num-nodes "3"
Where “pks1cl1″ is replaced by your cluster’s name,”api.pks1.lab13.myenv.lab” is replaced by the FQDN to your PKS API server, “pksadmin” is replaced by the username with admin rights to PKS and “my_password” is replaced with that account’s password. Create a sample PVC (Persistent Volume Claim). Note that the file is names pvc-sample.yml, the PVC name is “pvc-sample” and uses the “nfs” storageclass we created above. This step is not absolutely necessary, but will help confirm we can use the storage. Look for a version number for the version; note that it might take a few seconds for tiller in the cluster to get ready. Update helm local chart repository. We do this so that we can be sure that helm can reach the public repo and to cache teh latest information to our local repo. If this step results in a certificate error, you may have to add the cert to the trusted certificates on the workstation. Install helm chart with ingress enabled. Here, I’ve selected the Dokuwiki app. The command below will enable ingress, so we can access it via routable IP and it will use the default storageclass we configured earlier. Edit – April 23 2019 – Passing the credentials in here makes connecting easier later. 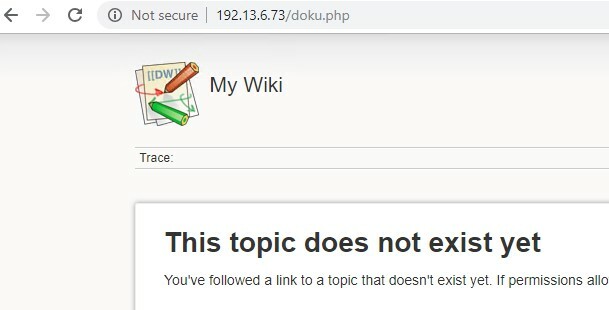 Point a browser at the external address from the previous step and marvel at your success in deploying Dokuwiki via helm to Kubernetes! Then login with username “user” and that password. This will list the PVCs and the volumes in the “default” namespace. Note the volume corresponds to the name of the VMDK on the datastore. Notice that since we are leveraging the NSX-T Container Networking Interface and enabled the ingress when we installed dokuwiki, a load-balancer in NSX-T was automatically created for us to point to the application. This took me some time to figure out; had to weed through a lot of documentation – some of which contradicted itself and quite a bit of trial-and-error. I hope this helps save someone time later!